When choosing a high-speed Internet provider, the choices are often limited by where you live. Companies such as Verizon, Comcast, Charter, Qwest/CenturyLink, and RoadRunner are highly regional. A company may dominate one area and basically not exist in another market. Here in Phoenix, Cox Communications is a major provider of high-speed Internet service. 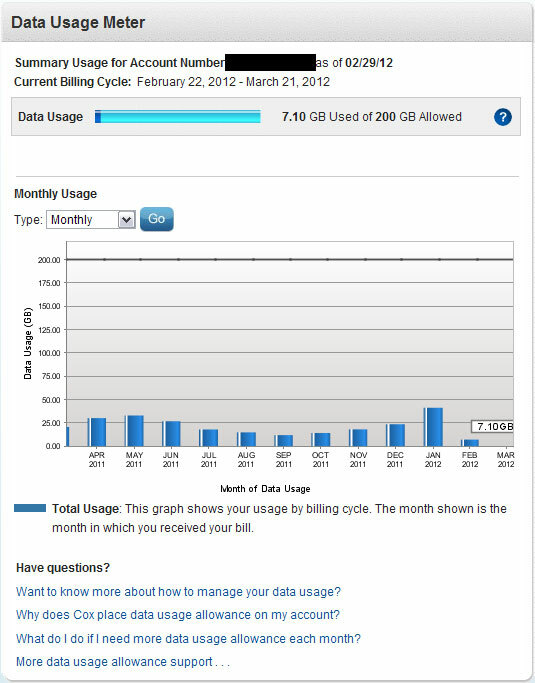 It’s interesting that subscribers are capped at a maximum of 200 GB per month. That seems like a very generous amount of Internet use, and as you can see, we don’t even come close to our monthly limit. The only scenario in which I can imagine using 200GB per month would be an unscrupulous fellow who leaves their BitTorrent uploads running 24/7. Even then, I don’t know that I could hit the limit. This tool is neat for a couple of reasons. First, you can use it to monitor your own usage. Second, you can use it to keep track of anyone else who might me using your network, such as over an unsecured Wi-Fi network. Unfortunately, the tool is not sophisticated enough to distinguish between PC traffic, gaming traffic from an Xbox 360 or PS3, and Netflix traffic. If you are a Cox Communications subscriber, log in to your account and check it out!